Vega 1/Liepāja players hit 15 three pointers in a 78-50 road win at RSU on Wednesday, December 7 and advanced to the Top 4 tournament. All time series: 4-5 (this season 1-0). Stat of the game: Liepāja players scored more points with three pointers than the entire RSU team in the first 35 minutes of the game (42-41). Stars of the game: Laura Audere had 18 points on 4-of-4 shooting from the point line. Sabīne Lipe added 11 points, including 3-of-3 shooting accuracy from downtown. Kristīna Petermane made four three pointers and scored 13 points. 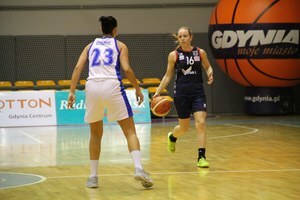 Kristīne Silarāja had eight points, 13 rebounds and four assists, while Ilze Jākobsone dished 13 assists. Ance Aizsila answered with 19 points. Next game: RSU vs TTT juniores (December 14).